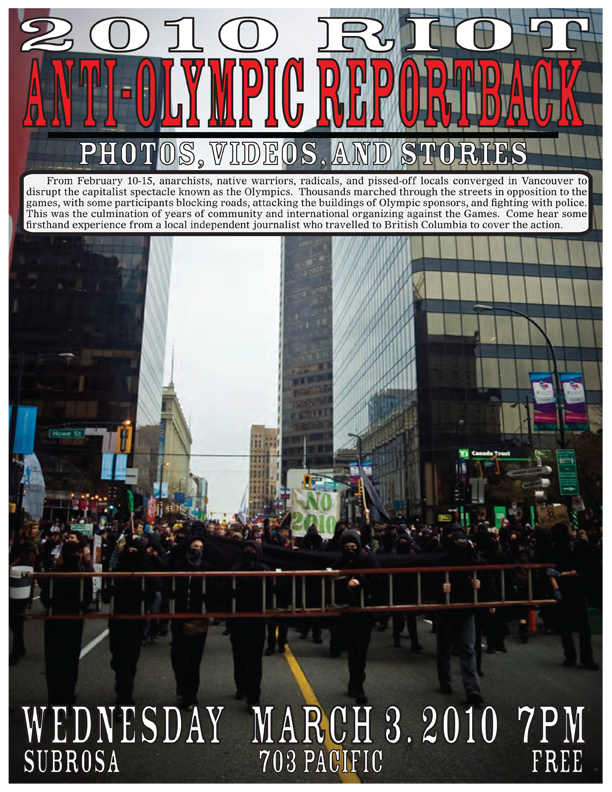 From February 10-15, anarchists, native warriors, radicals, and pissed off locals converged in Vancouver to disrupt the capitalist spectacle known as the Olympics. Thousands marched through the streets in opposition to the Games, with some participants blocking roads, attacking the buildings of corporate Olympic sponsors, and fighting with the police. This was the culmination of years of community and international organizing against the Games. Come hear some firsthand experience from a local independent journalist who travelled to British Columbia to cover the action. Join us at SubRosa from 7pm to 9pm on Wed, March 3rd for a night of photos, videos, and stories. This event is free.